In addition to the grid connected tidal test site at the Fall of Warness, EMEC also has a tidal test site that is not connected to the grid and which provides less challenging conditions for scale prototypes and marine operations. The site provides a more flexible sea space acting as a stepping stone between the test tank and real sea conditions. The 0.4 x 0.9km site is located in Shapinsay Sound, to the north-east of Kirkwall in water depths of 21-25m and experiences fairly benign current velocities with a peak tide of 1.5m/s. 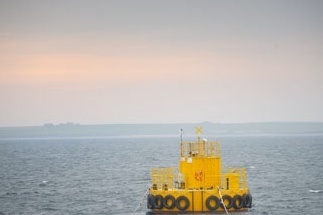 At the site, EMEC offers developers the use of a bespoke test support buoy. If required, the device under test will be connected to the test support buoy via two umbilical cables: one for power transmission and the other for control and communications. These buoys can relay data by wireless technology allowing developers to monitor performance remotely, as well as dissipating electricity generated by the device. The buoys are also equipped to supply the marine energy devices on test with power and act as navigational aids. Each test site comprises one berth with pre-laid foundation and attachment points, and an adjacent test area. The pre-laid foundations comprise 5m x 5m x 2m gravity-base frames loaded with densecrete blocks for equipment moorings. An area of seabed is also available for rehearsal or deployment of other tools and techniques. The EMEC Shapinsay Sound scale tidal test site is situated adjacent to the Orkney Mainland to the north-east of Kirkwall in the Orkney Islands, Scotland. The two test berths on site range from 21-25m water depth. A developer wishing to deploy a device at the test site must provide an outline of the proposed project. Developers are also requested to provide a Project-specific Environmental Monitoring Programme or Project-specific Navigational Risk Assessment (addendum to site-wide NRA). These documents must also identify any potential device-specific environmental or navigational risks, as well as any proposed mitigation measures or risk controls. EMEC is also required to give OIC at least 21 days’ notice of each new developer wishing to install at its scale sites. The site is also used as temporary anchorage location for full-scale developers accessing the Fall of Warness test site, to allow device maintenance or sheltered location whilst waiting for vessel or weather availability. Although some seals have been recorded in the area of the site, SNH have commented that this area is not a site of concern for seals. There have been sporadic sightings of cetaceans within the observation area, in particular Harbour Porpoise and Risso’s Dolphin. The nearby Scapa Flow area is an important wintering ground for many species of marine bird. Shapinsay Sound is included as part of the North Orkney proposed Special Protected Area (pSPA) which seeks to protect the breeding Red-throated diver and the following non-breeding waterfowl: Common eider, European shag, Great northern diver, Long-tailed duck, Red-breasted merganser, Slavonian grebe, and Velvet scoter. Further information on the North Orkney pSPA can be accessed here. EMEC Shapinsay Sound Non Grid-Connected Nursery Tidal Test Site is located in United Kingdom. The following field surveys were undertaken (or commissioned by) the EMEC to inform baseline characterisation. Water depths across the area compared well with the existing Admiralty Chart data, although the 20 m contour extends 140 m further west than previously thought to be the case. The type of sediment encountered reflects the degree of water movement that the site experiences, with little fines and a variety of rock and shell fragment size. Surficial sediments generally comprised maerl, maerl fragments, coarse sand, shell fragments, large shell fragments and stones. A relatively diverse benthic assemblage was identified. The community is considered to be predominantly a surface feeding one, with suspension feeders such as polychaetes, Jasmineira caudata, and the surface detritus feeding Polycirrus norvegicus featuring strongly in numerical terms. The survey also reports the presence of maerl. Raw data is publically available, however no report published as of yet.